When not being ridden or trained, the horses of Ramshyttan live a leisurely life outdoors with free access to food, water and straw-bedded shelter. The farm has around 18 ha of pasture and grazing land for the horses, including lake-side pastures, sparse forests, hillside pastures and grassy forest clearings. In summer we move them every few weeks letting the ground rest and the grass recover to avoid mud and damaged grass-roots. In winter when the ground is frozen and covered with snow we keep the horses in the field that adjoins the main barn with the biggest and warmest shelter. Here we also have close access to the stables which is convenient when needing to take the horses inside for grooming and tacking up. 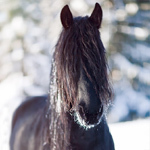 Our stables are not a place we keep our horses over night (unless for medical reasons), but they are a convenient and comfortable place for grooming, veterinary examinations, hoof care and getting the horses ready for riding or harness. Our stables are of modest size, featuring three stalls and one box, one tack room for visiting horses and one for our private equipment. There is also a storage area for feed and supplements as well as adjoining the rest of the barn where we keep hay and the horses have their free-access winter shelter. 2012 Pasture for young stallions / geldings. During spring and summer 2012 we will repeat our success from last year. 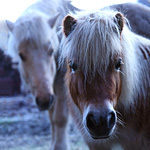 We have specially reserved one of our largest, loveliest fields for young stallions and geldings up to two years old. 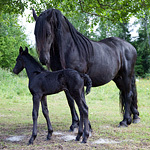 This is a tricky in-between time for those who have young colts as they are too sexually mature to graze with their mothers or other mares, but many feel it is too early to geld them. At this age it is also highly beneficial for the young stallions to interact with other youngsters their own age, so they may play, learn from each other, try their limits and receive the stimulus that adult horses seldom have the patience to give them. We will, however, let a couple of our older geldings graze with them much of the time, to keep them in check. The field we have reserved for the young horses is a beautiful 5 ha field of rolling grassy hills, fringed with shady forest all along one side. The field has a wind and weather shelter with straw bedding and free access to drinking water at all times. 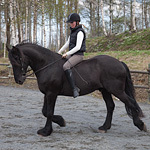 600 kr / horse / month when there is enough grass for full feed. 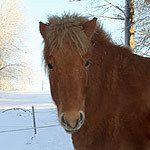 700 kr / month when the grass gets too sparse and we begin to give daily hay feeds. Access to main stables available when needed (except when the farm's mares are there for grooming). The price for colt pasture does not include your own tack room facilities, if you require this you will need full board. Feel free to contact us for inquiries! The grand old lady of Ramshyttan, Monadis was here before any of the other horses. A faithful and sweet natured lady who will let both toddlers, beginners and those with more experience ride her without the slightest complaint. Arion is leader of the herd, but friends with everyone. 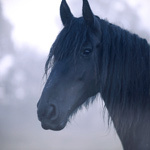 Imported from Holland at the age of three, this wonderful gelding was our first Friesian horse. 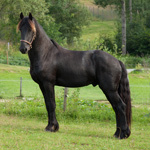 Curious, intelligent, and kind natured, Arion is easy to ride and lovely to handle. Our youngest member of the family, Arwen's foal born in June 2010. Phoenix has shown himself to be intelligent and a quick learner, but could at an early age already be quite fiery, hence the name ;). 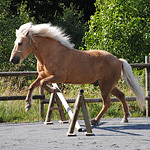 Phoenix' training has begun with ground work, with the aim of bitless riding. This friendly guy arrived here as a stallion the summer of 2011, but is now a gelding. 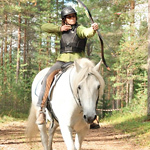 Legolas, who is best mates with Phoenix and Arion, is being ridden regularly in the forest as well as practicing long-reigns from the ground. Gaia arrived the summer of 2013, and instantly was a natural part of the herd and family. Though she has a calm and sweet nature, she has plenty of motor and power under the saddle and loves to work. Silver used to compete in show jumping and was going to be sold to a riding school but ended up with us. Silver is curious and friendly towards people, and though he may not be a horse for total beginners, he is positive and uncomplicated under the saddle. Our Lady Arwen was a special friend to us all, a most beautiful, sensitive and sociable horse who moved people's hearts and left a lasting impression on most that met her. 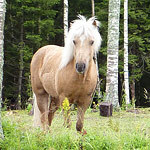 In 2011, the year before her passing, Arwen was officially awarded as Ster (Star mare).